The physical release includes a bonus DVD with a documentary about the composer. Born on 19th September 1911, Allan Pettersson was a singular voice in Swedish, and indeed European, 20th-century music. Raised in a poor neighbourhood in Stockholm, his first instrument was a fiddle made by one of his brothers from a tin box and some strings, and Pettersson immediately realized that music was his calling. In 1939 he won a place as viola player in what is today the Royal Stockholm Philharmonic Orchestra, but at this time he also began to compose – at first his Barfotasånger (Barefoot Songs) and chamber works. It was towards the very end of the 1940s, while he was working up the courage to leave his steady position, that he began to compose his Symphony No.1. In a letter he recounted how the symphony was growing and growing, and even threatened to swallow him up whole. Perhaps as a result of a study visit to Paris, where he had lessons with René Leibowitz and Arthur Honegger, Pettersson laid the work aside, but during the following years – and possibly as late as in the 1970s – he kept returning to the sketches. He certainly never abandoned the symphony, and in 1953 when he completed a second symphony, he insisted on calling that work his 'No.2'. 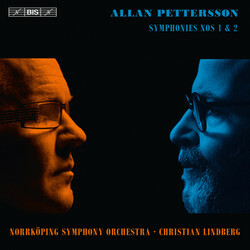 On two previous discs, Christian Lindberg has conducted Pettersson's Three Concertos for String Orchestra as well as the orchestral versions of the Barefoot Songs. These were released to great acclaim, for instance in Fono Forum, whose reviewer dubbed Lindberg and the Nordic Chamber Orchestra 'more than ideal interpreters of Pettersson's music, which is as stark as it is fascinating'. Entrusted with the manuscript material – some 240 pages – of Symphony No.1, Lindberg was able to prepare a performable version and gave the work its world première in May 2010, conducting the Norrköping Symphony Orchestra. His recording of the work – and of Symphony No.2 – is accompanied by a DVD with an hour-long film by David Lindberg about Allan Pettersson's First Symphony documenting its genesis, the preparation of the performance edition and the path to the work's first performance and subsequent recording.